Every homeowner who has a garage door will eventually run into some sort of issue where they are unable to get in or out of their home. When this problem occurs, it can be very frustrating. Although it may be tempting to try and fix it on your own, handling these types of systems poses several safety risks, and should only be attempted by an experienced professional. That's where our team comes in. Below are a few of the most common problems that you may encounter. Be sure to give us a call when you do. Such a problem can result from a number of causes. For once, it may not be stuck at all but simply non-responsive, due to either old batteries in your remote or the being unplugged or turned off. These may seem "silly" things not to notice immediately, but when you're hurrying to go to work you can easily miss them. Once you've ruled these possibilities out, there could be a larger issue at hand. 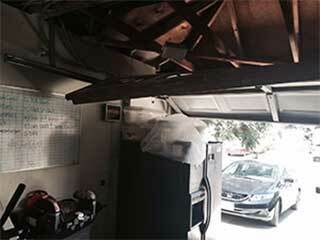 Garage doors that have been hung unevenly can quickly get stuck. Springs that are uneven or cables that aren’t the same length can also contribute to this problem and require professional repair. Any grinding or squealing noises that occur when the unit is operating are often signs that something is wrong. It could be as simple as a lack of lubrication, but sometimes even that won’t fully fix the problem. We'll be happy to check that you don’t have any loose components or pieces that are rubbing against each other. Finally, if your door falls quickly instead of lowering safely down when it closes, you might be facing a very dangerous situation. Anyone caught underneath it can be hurt. This can happen when springs are stretched out or a cable has broken. Never try to replace springs by yourself as they can cause a lot of physical harm if not handled correctly. There are many other issues your garage door can experience, so be sure to give our experts a call if you suspect anything. It's better to be safe than sorry.